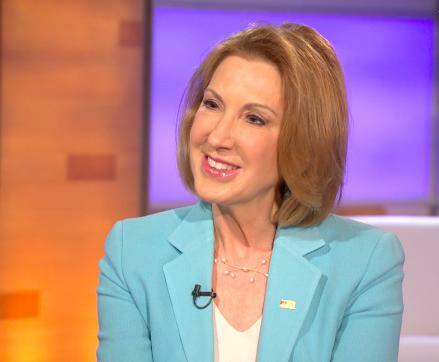 Watch Katie's complete interview with Carly Fiorina here. Yahoo Global News Anchor Katie Couric sat down with Carly Fiorina on Monday, just hours after Fiorina made her 2016 presidential plans official with an announcement on ABC’s “Good Morning America,” to discuss where she stands on some of the most pressing issues and why, exactly, she’s running. Fiorina made a name for herself in the tech industry, climbing the ranks at AT&T and becoming the CEO at Hewlett-Packard — and the first female head of a Fortune 500 company — in 1999, before being forced to resign in 2005. She told Couric on Monday that she plans to run on her record at Hewlett-Packard, crediting her role as a business leader with preparing her to make the decisions required of a world leader — no matter how tough they might be. She pointed to Clinton’s handling of the 2011 terrorist attack on the U.S. Embassy in Benghazi, the revelation that she used her private email server as secretary of state, and the recent accusations of undisclosed foreign donations to the Clinton Global Initiative as examples. Fiorina also dismissed the suggestion that serving in such roles as U.S. senator and secretary of state are accomplishments. Want to learn more about Carly Fiorina click here. Couric asked Fiorina if she regretted the ad, given comments she has made against vitriolic campaigning, or if we can expect more ads like that as the primary progresses. Fiorina, who is a breast cancer survivor, recalled an interaction with her doctor during cancer treatment to explain why she is opposed to legalizing marijuana. When she told her doctor she wasn’t interested in using medical marijuana, Fiorina says, her doctor told her, “Good,” because “we don’t know what marijuana is anymore. It’s a chemically complex compound, we don’t know how it interacts with other drugs, we just don’t understand this anymore." Fiorina joins a growing Republican primary field, with popular conservative neurosurgeon Ben Carson having thrown his hat into the ring. On “Good Morning America” Monday morning, Fiorina said her lack of political experience is part of what makes her a good candidate. Note: Carly Fiorina stated that CEO of Apple, Tim Cook, talked about “boycotting Indiana.” In fact, Tim Cook has never discussed calling for a boycott of businesses in Indiana.